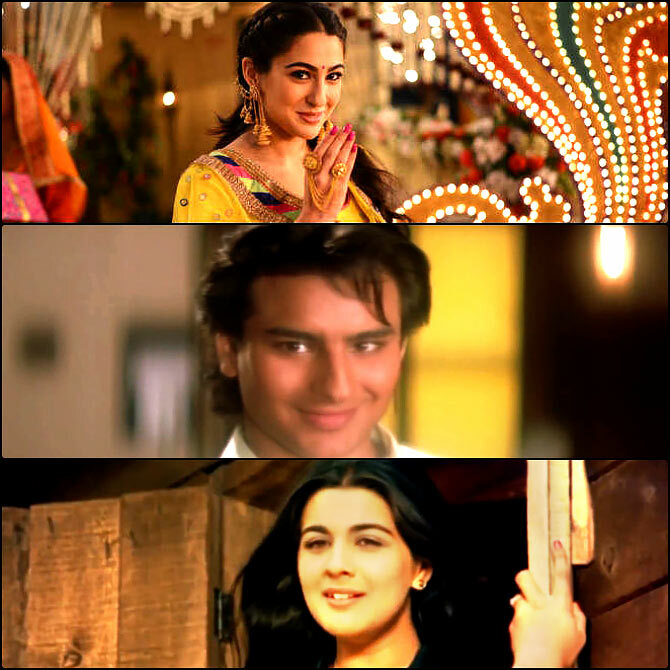 Rediff.com » Movies » Was Saif's debut as AMAZING as Sara's? Who said star kids have it easy? With a big launchpad comes bigger responsibility. Star children may have it ridiculously easy on numerous fronts, but the constant pressure to measure up to their famous parents' achievements can be daunting. Wouldn't it be fairer to look at the first films of both parent and progeny? Sukanya Verma does just that. 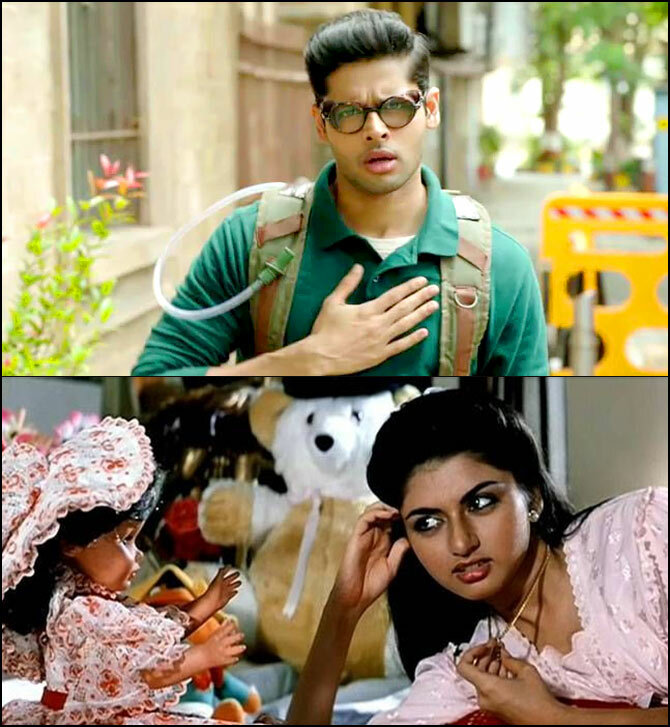 Bhagyashree's dandy son made his debut with Mard Ko Dard Nahi Hota, Vasan Bala's critically acclaimed ode to movies and martial arts. Dassani plays a man suffering from a rare disorder that makes him insensitive to pain and extraordinary in combat. Bhagyashree's sweet, girl-next-door portrayal as Salman Khan's favourite friend in Sooraj R Barjatya's rich boy-poor girl romance turned her into a heartthrob overnight, a title she chose to relinquish after marriage. She made an exception only to star opposite husband Himalaya in a handful of forgettable movies. Even before she made her big screen debut in Abhishek Kapoor's Kedarnath, Sara impressed everyone with her eloquence on Koffee With Karan. Her spontaneity and freshness in Kedarnath translated to box office appreciation too. 'Abba' Saif Ali Khan's first release showcased his somewhat awkward, anglicised demeanour labouring to match wits with Aamir Khan and Sunil Dutt in the Yash Chopra-multistarrer Parampara. Coming close on the heels of J P Dutta's similarly themed Kshatriya, it fizzled out. Mom Amrita Singh's vibrant nakhras finding true love in Sunny Deol's childhood sweetheart against lilting melodies and Kashmir's scenic valleys ensured that Rahul Rawail's Betaab found a spot among 1980s classics. 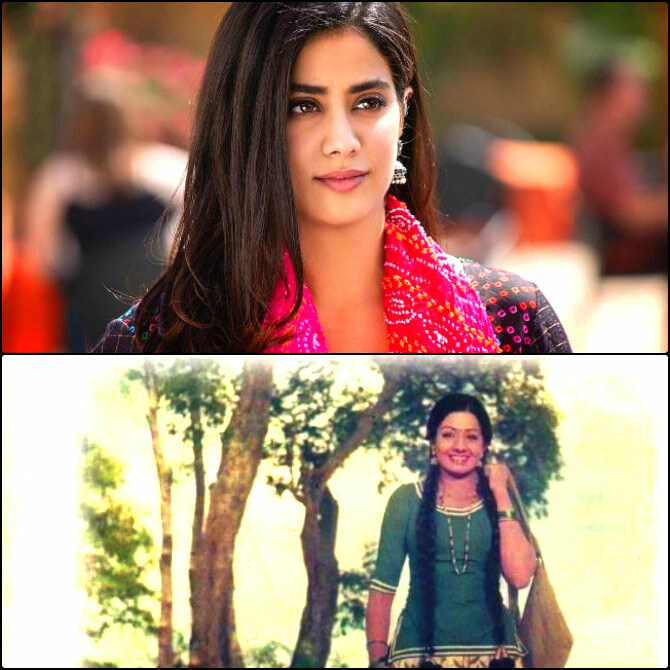 Dharma's glammed-up remake of the Marathi blockbuster Sairat didn't do anything for Hindi cinema except kick-start the spruced up, camera-friendly Janhvi Kapoor's innings in Bollywood. Her legendary mother Sridevi began her career as a child actor down South who went on to rule Bollywood like few have. But her first Hindi film is the obscure Solva Saawan, co-starring Amol Palekar, where she plays a gawky village belle. 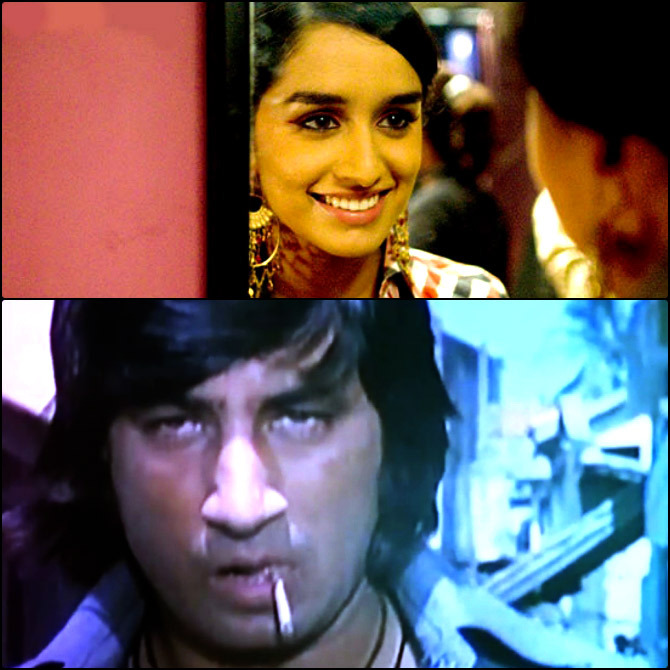 Jackie did a bit role as Shakti Kapoor's sidekick in Swami Dada before making his full-fledged debut as a lead in and as Hero. Audiences loved his deadpan intensity and ruffian swagger as the bad boy turning new leaf in Subhash Ghai's musical masala. 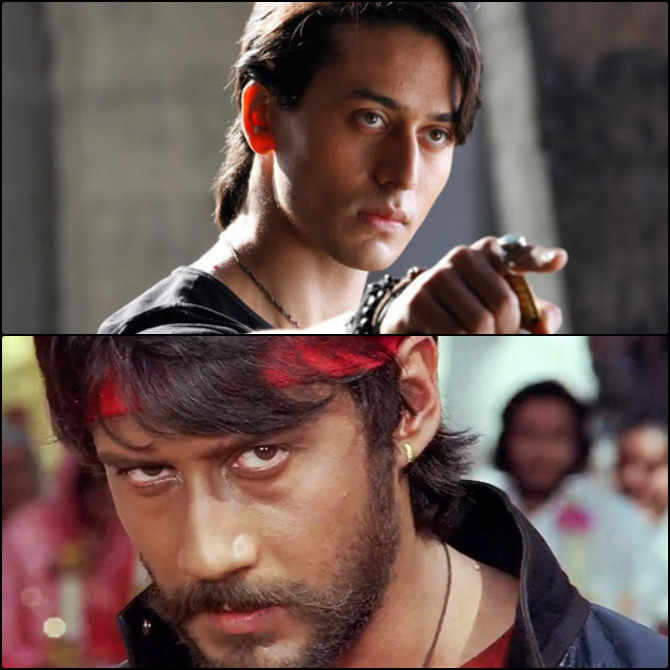 His dancing, fighting, nimbleness-equipped son, Tiger invited the inevitable comparisons when he signed up for Sabbir Khan's Heropanti. Although the film isn't an exact remake, the title and the use of the original's signature flute is an unabashed attempt to cash in on the connection. 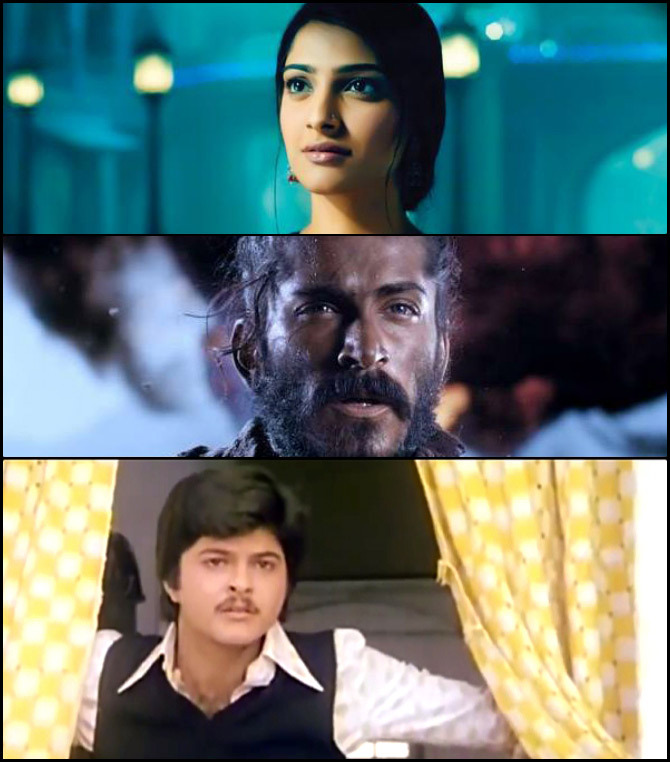 Both Sonam and Harshvardhan's first movies were hyped launchpads directed by Bollywood's finest -- Sanjay Leela Bhansali and Rakeysh Omprakash Mehra, known for their lavish touches and vision. Both Saawariya and Mirzya were epic misfires. Their father started out modestly as one of Raakhee's three children squabbling with Sanjeev Kumar's brood in Umesh Mehra's Hamare Tumhare before hitting the big league in leading roles like Woh Saat Din, Mashaal, Meri Jung and Karma. Sonakshi's spunky gaonwali, fearing pyaar over thappad, caught everyone's eye in an out-and-out Salman Khan vehicle, Dabangg. 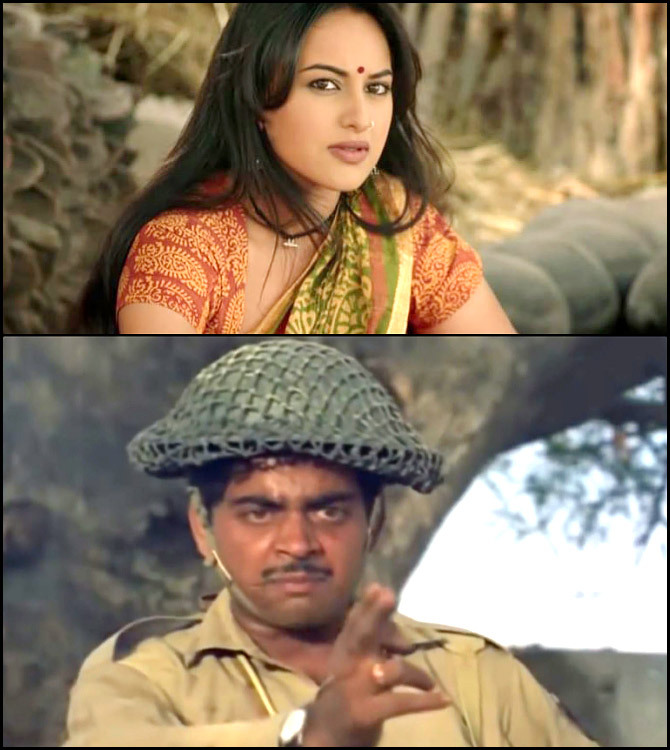 Years before, Shatrughan Sinha's short but effective role as the belligerent Pakistani armyman in Dev Anand's Prem Pujari made an equally solid impression. In Khel Khilari Ka, Shakti Kapoor plays one of the four gully ka goondas side-lining the Dharmendra-Shabana Azmi mindless masala showing off his trademark impropriety to its fullest potential. But his career truly took off only after Feroz Khan's Qurbani. Beti Shraddha would endure a similar fate with her inconsequential debut in Leena Yadav's Teen Patti until Aashiqui 2 came to her rescue. When Suniel Shetty took a break from his various businesses to play the justice-seeking hulk of Balwaan, nobody expected it to become a runaway success. Despite unanimous criticism for his acting (or lack of) skills, Shetty's raw action prowess won a fan club. 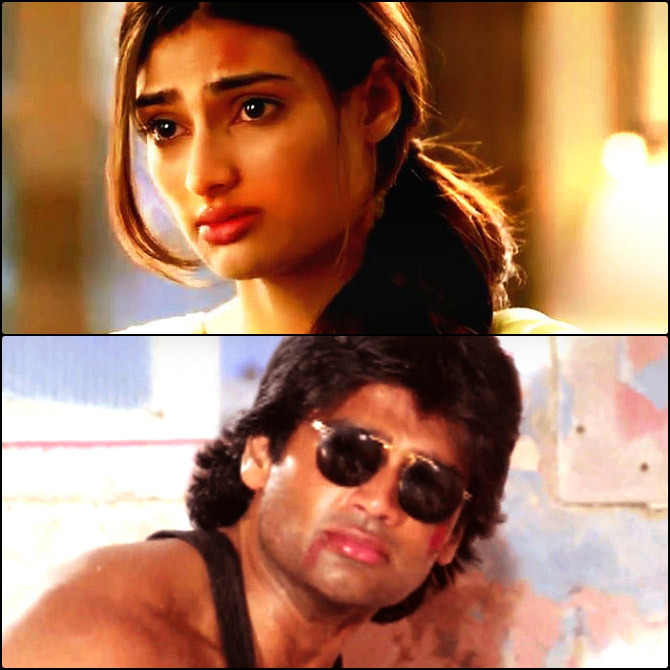 Athiya's glossy debut in Hero, a remake of the Ghai original, backed by Salman Khan, got her the platform if not the recognition she craved. Ranbir Kapoor's Sawaariya bombed, but all hailed his effortless talent. His decision to be part of unique stories that may not always be box office draws is part of his appeal. Rishi Kapoor first appeared on screen as a child actor and younger Raj Kapoor in his father's cult classic, Mera Naam Joker. Though the movie failed, it earned him a National Award. But Chintu's sparkling turn as a poor little rich boy in Bobby, his adult debut, also directed by his dad, was a roaring commercial success. 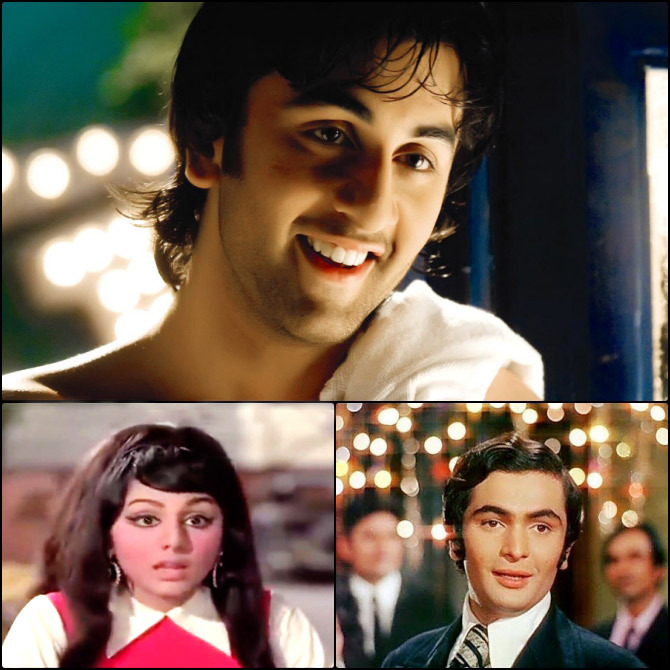 Ranbir's mum Neetu gained popularity as a child actor in Do Kaliyan under the name of Baby Sonia. 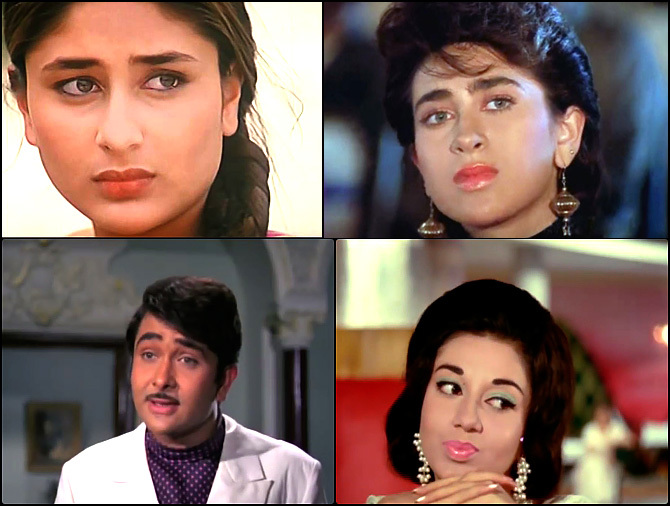 Her grown up debut, Rickshawala opposite future brother-in-law Randhir Kapoor though, is eminently forgettable. 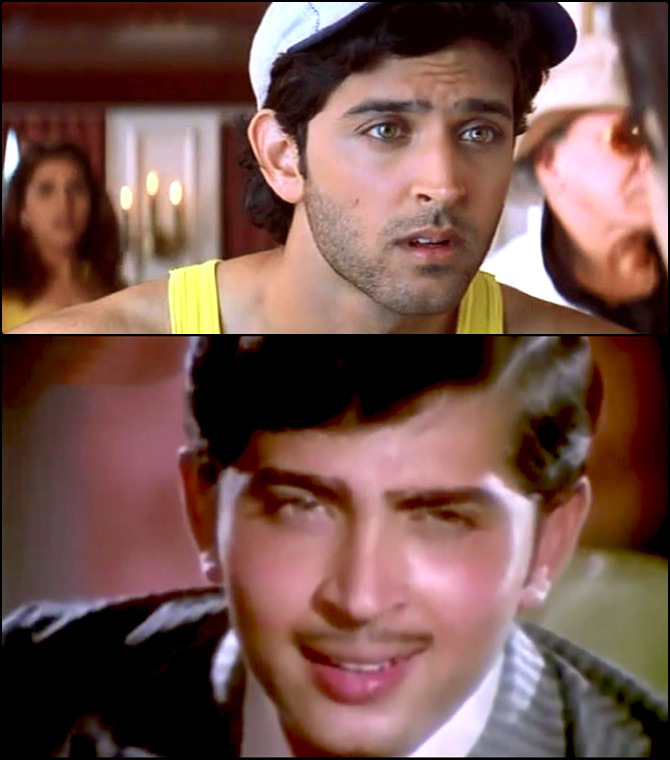 Though Rakesh Roshan didn't have a memorable run as a leading man and soon switched to film-making, his debut is quite an eyeful as the young suitor in the Balraj Sahni-Nirupa Roy weepie, Ghar Ghar Ki Kahani. Nothing close to son Hrithik's light-eyed, chiselled faced, superstar charisma and truckloads of talent rocking a double role in the daddy-directed launchpad, Kaho Naa...Pyaar Hai. The film was a big hit and turned Duggu into an overnight craze. Randhir Kapoor made his debut as actor and director in Kal Aaj Aur Kal, which sees him sharing frame with father Raj and grandfather Prithviraj Kapoor. His energy and flamboyant fashion is surely one of its kind whereas Babita's first stab on silver screen, Dus Lakh is typical 1960s fluff. Their elder daughter Karisma made a splash with Prem Qaidi, but it was Kareena who hit bull's eye with Refugee, impressing both critics and the audience. 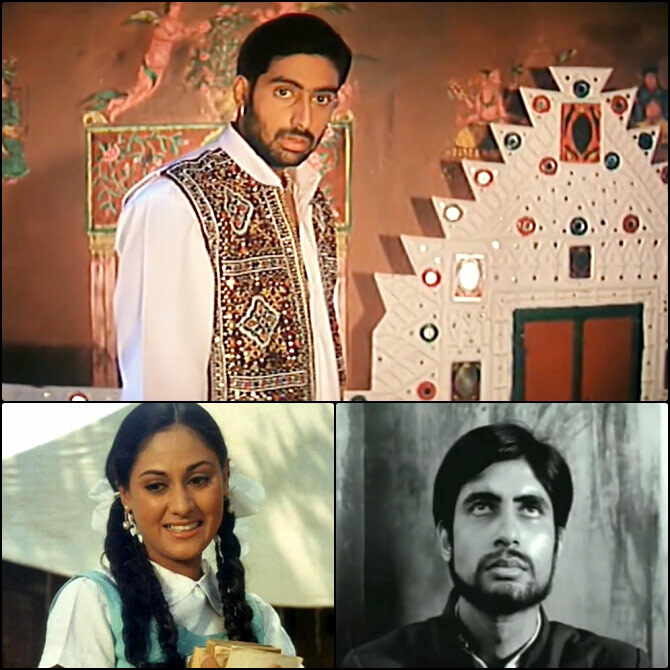 Amitabh Bachchan made a relatively quiet debut under K A Abbas' direction in the National Award-winning Saat Hindustani. Though discovered by Satyajit Ray, who cast her in a supporting role in Mahanagar, Jaya Bachchan (then Bhaduri) made her Hindi film debut in Hrishikesh Mukherjee's Guddi. Her innocence and simplicity as the Dharmendra fangirl made it an iconic character. When their son Abhishek decided to enter films, there was obvious flimflam and curiosity. His debut in J P Dutta's Refugee is not the usual star kid showreel but an ordinary response, constant comparisons to his father's superstardom (which he only worsened by modelling himself on AB instead of working on his individuality) and Hrithik Roshan's burgeoning fame refused to let him be.